Martin remains unsigned as an unrestricted free agent, Matt Kawahara of The San Francisco Chronicle reports. Martin toted the rock 21 times for 100 yards in Sunday's 35-3 loss to the Chiefs. Martin rushed for 107 yards and one touchdown on 21 attempts, adding one reception for nine yards during Monday's 27-14 win against the Broncos. Martin carried nine times for 39 yards during Sunday's 30-14 loss to the Bengals. Analysis: Martin received single-digit carries for the first time since Week 6 and managed a long gain of just nine yards. He failed to bring in his only target in the passing game and now has just two receptions over the last three games combined. Martin rode a three-game touchdown streak into this one, which had given him some fantasy value, but his yardage totals are too light to rely on each week. He'll look to take advantage of a beatable Broncos run defense next Sunday. Martin rushed 16 times for 32 yards and a touchdown in the Raiders' 24-21 win over the Steelers on Sunday. Martin (knee) is listed as active for Sunday's game against the Steelers. Martin (knee), who is listed as questionable for Sunday's game against the Steelers, is expected to play, a source told Ian Rapoport of NFL Network. Analysis: Martin was a full practice participant Wednesday through Friday, so it's somewhat surprising he carried an injury designation into the weekend in the first place. Nonetheless, the report should give Martin's fantasy managers more confidence in rolling fantasy lineups for the matchup with the Steelers, who have ranked 11th in the NFL this season with 4.2 yards per carry allowed. The Raiders are listing Martin (knee) as questionable for Sunday's game against the Steelers, Matt Kawahara of the San Francisco Chronicle reports. Analysis: Martin was a full participant in practices Wednesday and Thursday and took part in Friday's session in at least some fashion, so it seems likely that he'll be available to play this weekend. If Martin suits up as anticipated, there's a chance his workload could be more restricted than usual if the Raiders -- who are double-digit home underdogs -- are forced to abandon the run game. That would yield a more favorable game script for passing-down specialist Jalen Richard than Martin. Martin (knee) practiced fully Wednesday. Analysis: Matt Kawahara of the San Francisco Chronicle previously relayed there might be some uncertainty regarding Martin's Week 14 status after the team signed fellow running back C.J. Anderson on Tuesday. However, Martin's full participation in the Raiders' first session of the week suggests that he'll be good to go Sunday versus the Steelers. That said, it will still be worth monitoring Martin's situation in the event his reps are limited either Thursday or Friday. Martin has a knee injury and is uncertain to play Sunday against the Steelers, Michael Gehlken of the Las Vegas Review-Journal reports. Martin accounted for 61 rushing yards, one touchdown and a lost fumble on 18 carries, adding two receptions for six yards during Sunday's 40-33 loss to Oakland. Martin ran for 51 yards and a touchdown on 11 carries and added 21 yards on three catches during Sunday's 34-17 loss to Baltimore. Martin (ankle) doesn't have a designation on the final injury report for Sunday's game in Baltimore. Analysis: Martin was a limited practice participant each day this week after sitting out the second half of a 23-21 win over the Cardinals on Sunday. He'll have a tough time parlaying availability into productivity with the Raiders considered heavy underdogs against a Ravens team that surrenders just 3.9 yards per carry and 94.6 rushing yards per game. 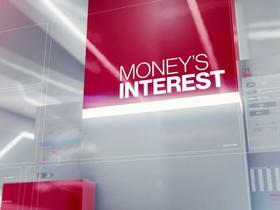 Martin (ankle) remained listed as limited at Thursday's practice, Paul Gutierrez of ESPN.com reports. Analysis: With coach Jon Gruden having previously downplayed Martin's ankle issue, we suspect that the running back is trending toward active status Sunday against the Ravens. We'll revisit Martin's status Friday to see if he is listed as questionable for the contest or is removed from the Raiders' Week 12 injury report altogether. Martin (ankle) was limited at Wednesday's practice. Analysis: Coach Jon Gruden previously downplayed Martin's ankle issue and the fact that the running back practiced Wednesday -- albeit in a limited capacity -- supports that view. Martin's activity will bear monitoring in the coming days, but if he's able to go Sunday against the Ravens, he should head the Raiders' Week 12 backfield. Coach Jon Gruden doesn't believe Martin's ankle injury is serious, Michael Gehlken of the Las Vegas Review-Journal reports. Martin will undergo further evaluation Monday after tweaking his ankle in Sunday's 23-21 win over the Cardinals, Michael Gehlken of the Las Vegas Review-Journal reports. "I thought it was going to be one of those, 'Tweak it and just run on it and be back good again,' but it just kept lingering," Martin said of the injury. Martin's ankle injury doesn't appear too serious, Matt Schneidman of The San Jose Mercury News reports. Martin injured his ankle during the first half of Sunday's 23-21 win over the Cardinals, Matt Schneidman of The San Jose Mercury News reports. Analysis: This explains why Martin didn't get any touches in the second half after taking 10 carries for 52 yards (and one catch for six yards) through the first two quarters. Jalen Richard and DeAndre Washington split work after halftime, with each of the three Oakland running backs ultimately landing between 10 and 12 carries. The team won't have a clear replacement for Martin's power-running role if the 29-year-old isn't available for a Week 12 game in Baltimore. Martin rushed 15 times for 61 yards and caught all three of his targets for 31 more yards in Sunday's 20-6 loss to the Chargers. Analysis: Martin was perhaps the lone bright spot in an otherwise dull day for the Raiders. The yardage total was his best of the year and accompanied a season-high 15 carries. 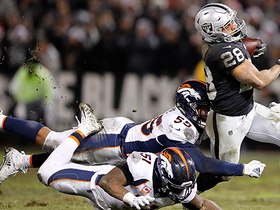 He out-touched Jalen Richard 18 to eight, but with Oakland struggling to find the end zone, touchdowns will be hard to come by for the 29-year-old. While he still has not scored this season, he does at least have an appealing Week 11 matchup at Arizona. Martin (hip) doesn't have an injury status for Sunday's game against the Chargers, Michael Gehlken of the Las Vegas Review-Journal reports. Analysis: Martin started the week with a pair of limited practices and never seemed to be in much danger of missing the game. Workload is his real concern on an Oakland team that's been struggling to keep games competitive. The Chargers have given up 4.4 yards per carry, but their success on the other side of the ball has sometimes forced opponents to abandon the run, including a 26-10 win over the Raiders in Week 5 when Marshawn Lynch (groin) was limited to nine carries. Martin was limited at Wednesday's practice due to a hip injury, Matt Schneidman of The San Jose Mercury News reports. Analysis: Martin likely picked up the minor injury during Thursday's 34-3 loss to the 49ers, a game in which he finished with 11 carries for 49 yards and one catch for 20 yards on two targets. He's locked in as the Raiders' lead ballcarrier with Marshawn Lynch (groin) on injured reserve, but a Week 10 game against the Chargers looks like another matchup that could lead to regular snaps for passing-down back Jalen Richard. The hip injury doesn't seem to be nearly as much of a concern for Martin's outlook. Martin rushed 11 times for 49 yards and brought in one of two targets for 20 yards in the Raiders' 34-3 loss to the 49ers on Thursday. Martin rushed 13 times for 72 yards while catching both of his targets for 17 yards and losing a fumble in Sunday's 42-28 loss to the Colts. Analysis: Martin was the clear-cut top option on the ground in the wake of Marshawn Lynch's groin injury, as Jalen Richard and DeAndre Washington combined for just three carries. The former Buccaneers running back lost a costly fumble one play after Indianapolis took a 35-28 lead in the fourth quarter. By the time Oakland next got the ball, it was 42-28. Martin won't have much time to dwell on that mistake, as he'll be right back in action Thursday in a Week 9 tilt with the 49ers. Coach Jon Gruden referred to Martin as a "feature back" Wednesday, Michael Gehlken of the Las Vegas Review-Journal reports. With Marshawn Lynch (groin) now on IR, Martin is in line to see added work, beginning Sunday against the Colts. Martin is expected to handle a leading role out of the Oakland backfield with Marshawn Lynch (groin) likely to be sidelined for at least a month, Michael Gehlken of the Las Vegas Review-Journal reports. Martin caught his lone target for eight yards and did not record a carry in Sunday's 27-3 loss to the Seahawks. Martin rushed for one yard on two carries and failed to secure his lone target in Sunday's 26-10 loss to the Chargers. Analysis: Martin was generally uninvolved Week 5 as the Raiders played from behind for most of the contest, while starter Marshawn Lynch logged only nine carries of his own. 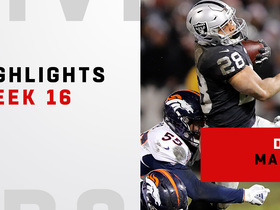 Oakland failed to get anything going on the ground as they rushed for 41 yards on 13 carries as a team, though fellow backup Jalen Richard hauled in a team-high six passes. Martin's usage figures to remain limited heading into a Week 6 matchup against the Seahawks. Martin rushed for 11 yards on five carries in Sunday's 45-42 overtime win over the Browns. Analysis: Martin averaged just 2.2 yards per carry while starter Marshawn Lynch led Oakland's backfield with 130 rushing yards on 20 carries. Martin also was overshadowed by both Lynch and Jalen Richard in the passing game, as the latter duo combined for six receptions and 65 yards on 10 targets. Martin's general lack of involvement was related to the high-scoring nature of the contest as quarterback Derek Carr attempted 58 passes. Martin rushed for 43 yards on nine carries in Sunday's 28-20 loss to the Dolphins. 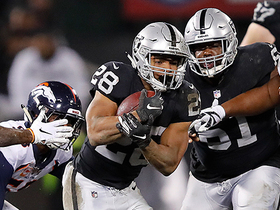 Analysis: Martin posted season highs in both yardage and touches Week 3, but starter Marshawn Lynch once again led the Raiders backfield en route to 64 yards and a score on 19 carries. Martin also was overshadowed by fellow backup Jalen Richard in the passing attack, as the latter accounted for six receptions for 59 yards on seven targets. Martin's fantasy value remains limited to deeper leagues while Lynch and Richard continue to produce at full health. Martin rushed for 24 yards on seven carries and caught his lone target for no gain in Sunday's 20-19 loss to the Broncos. Analysis: Martin has now logged 14 total touches through two weeks despite a limited snap count, serving as Marshawn Lynch's handcuff out of the Raiders backfield. Martin was deployed for 17 offensive snaps compared to just eight for fellow reserve running back Jalen Richard, whose lack of usage stemmed from Oakland leading the entire game before a last-second field goal by Denver. Expect a similar role for Martin again Week 3 against the Dolphins as Lynch remains healthy. Martin rushed for 20 yards on four carries and caught two passes on as many targets for a loss of three yards in Monday's loss to the Rams. Martin took six carries for 24 yards in Friday's preseason game against the Packers. Raiders coach Jon Gruden suggested Martin won't get much playing time in Friday's preseason game against Green Bay, Vic Tafur of The Athletic Bay Area reports. Analysis: Gruden seems to be indirectly hinting that Martin will have a spot on the 53-man roster. 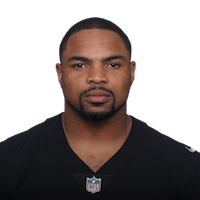 The 29-year-old back took one carry for three yards in Oakland's preseason opener, but then was held out -- along with a slew of other veterans -- for Saturday's loss to the Rams. 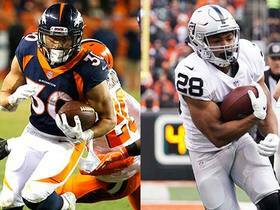 Gruden likely wants to use the third preseason game to evaluate Jalen Richard, DeAndre Washington and Chris Warren. Marshawn Lynch's status as the lead back is the only true piece of clarity in the Oakland backfield. Martin made his Raiders debut during Friday's preseason opener against the Lions and rushed one time for three yards. 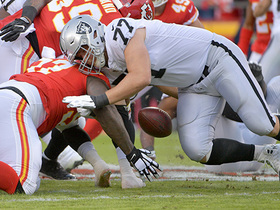 Analysis: Neither Martin nor starter Marshawn Lynch saw much action Friday, which isn't much of a surprise during a preseason game in which quarterback Derek Carr saw only one drive. Although both DeAndre Washington and Chris Warren flashed in relief of them, there's been nothing to suggest Martin's grip on the No. 2 role is in any danger at this stage. Martin made a positive impression on Raiders offensive coordinator Greg Olson during the offseason program, Matt Kawahara of The San Francisco Chronicle reports. The Raiders signed Martin to a contract Thursday, Ian Rapoport of NFL Network reports. Analysis: In his two full 16-game slates, Martin racked up 1,400 rushing yards both times, 743 combined receiving yards and 19 total touchdowns. However, the other four years with the Bucs were rife with injuries, ineffectiveness and suspensions, setting up his release from the team on Feb. 20. With his next destination determined, Martin can focus on a bounce back, but it may be difficult in a backfield populated by Marshawn Lynch, DeAndre Washington and Jalen Richard. Martin made a good impression in a recent face-to-face meeting with Raiders coach Jon Gruden, Ian Rapoport of NFL Network reports. The Buccaneers released Martin on Tuesday, Rick Stroud of the Tampa Bay Times reports. Martin rushed three times for minus-3 yards in Sunday's 31-24 win over the Saints. Martin rushed six times for seven yards in Sunday's 22-19 loss to the Panthers. Buccaneers head coach Dirk Koetter said following Monday's 24-21 loss to the Falcons that Martin was inactive for the contest due to an unspecified violation of team rules, RIck Stroud of the Tampa Bay Times reports. "It's done. That's just one of those things that unfortunately has to happen from time to time," Koetter said, regarding Martin being made a healthy scratch. "It's behind us now, and that's all I'm going to say about it." Martin (coach's decision) is inactive for Monday's game versus the Falcons, Greg Auman of the Tampa Bay Times reports. Analysis: About an hour before the release of inactives, Adam Schefter of ESPN leaked that Martin would be superseded as the starter in favor of Peyton Barber. In a surprising turn on events, though, Martin is a healthy scratch due to a violation of team rules, according to ESPN's Monday Night Countdown. With Martin sidelined, Barber will lead the way out of the Buccaneers backfield, while Charles Sims handles pass-catching reps and Jacquizz Rodgers serves in a change-of-pace role. According to Adam Schefter of ESPN, the Buccaneers are expected to start Peyton Barber at running back, relegating Martin to a backup role. Analysis: During Martin's absence in Week 13 with a concussion, Barber impressed as both a runner and pass catcher, racking up 102 yards on the ground and 41 more through the air. Last weekend versus the Lions, Martin started but didn't see the field after a fumble late in the second quarter. Barber proceeded to outproduce Martin, 63 to 50, in scrimmage yards. With Barber leading the way again Monday, it remains to be seen what kind of workload, if any, Martin receives. The Buccaneers do not plan on naming a clear-cut starter between Peyton Barber and Martin for Monday night's game against the Falcons, leaving the latter's expected workload uncertain, Greg Auman of the Tampa Bay Times reports. Martin believes he was benched after fumbling during a 24-21 loss to the Lions on Sunday, ESPN.com's Jenna Laine reports. "When you turn the ball over and you fumble, your chances get cut pretty short, so that's what happened there," said Martin. Martin rushed 10 times for 26 yards and a touchdown and brought in two of three targets for 24 yards in Sunday's 24-21 loss to the Lions. He also lost a fumble. Martin will start at running back for the Buccaneers in Sunday's game against the Lions, a source informed Adam Schefter of ESPN reports. Martin was cleared from the protocol for head injuries Thursday, Scott Smith of the Buccaneers' official site reports. Martin may start Sunday's game against the Lions if he gains clearance from the concussion protocol, Roy Cummings of WFLA NewsChannel 8 reports. Martin (concussion) was a full practice participant Wednesday, Jenna Laine of ESPN.com reports. Analysis: While this doesn't mean Martin has made it out of the concussion protocol, it does put him on track to play in Sunday's game against the Lions. The extent of his role in that contest will be subject to scrutiny, as Peyton Barber gained 102 yards on 23 carries and 41 yards on four catches in Sunday's 26-20 loss to the Packers. Martin hasn't produced that many scrimmage yards or rushing yards in a single contest since Week 11 of 2015. Martin (concussion) returned to practice Wednesday, Greg Auman of the Tampa Bay Times reports. Martin (concussion) has been ruled out for Sunday's game in Green Bay, Tom Silverstein of the Milwaukee Journal Sentinel reports. Analysis: Martin was unable to practice at all this week, which puts him in danger of missing time beyond Sunday. His absence leaves Jacquizz Rodgers as the likely starter, but there's no guarantee the role leads to a large workload, given that Peyton Barber and Charles Sims also figure to be involved. Martin (concussion) wasnt present for Friday's practice, Greg Auman of the Tampa Bay Times reports. Martin (concussion) was a non-participant in Thursday's practice, Tom Silverstein of the Milwaukee Journal Sentinel reports. Martin (concussion) was a non-participant at Wednesday's practice, Jenna Laine of ESPN.com reports. Analysis: Entering the concussion protocol Sunday in Atlanta, Martin hasn't reached his baseline marker, which would allow him to take part in portions of practice. Until he does, DNP will be next to his name on Buccaneers injury reports. If Martin eventually misses Sunday's game at Green Bay, Jacquizz Rodgers, Charles Sims and Peyton Barber will split the running back reps in same way, shape or form. Martin has been ruled out of Sunday's game in Atlanta due to a concussion, Rick Stroud of the Tampa Bay Times reports. Analysis: On the Buccaneers' first series of the game, Martin asked to come off the field at one point but ultimately continued to play, per Greg Auman of the Tampa Bay Times. When exactly Martin suffered the head injury is unknown, but he'll now be subject to the league's protocol in order to return. In the meantime, Jacquizz Rodgers should handle most of the carries, while Charles Sims and Peyton Barber handle change-of-pace roles. Martin rushed 19 times for 38 yards and brought in two of three targets for six yards in Sunday's 30-20 win over the Dolphins. Martin rushed 20 times for 51 yards and failed to bring in either of his targets in Sunday's 15-10 win over the Jets. Analysis: After logging a season-low eight rushes in the Week 9 loss to the Saints, Martin was back to a much more normal workload Sunday. However, he found running room very hard to come by, leading to his third game with less than 3.0 yards per carry over the last four contests. Martin appears to be running with good burst, so a substantial part of his struggles could likely be laid at the feet of his offensive line. He'll have a chance to get his numbers up against the Dolphins in a Week 11 road tilt. Martin rushed eight times for seven yards in Sunday's 30-10 loss to the Saints. Kansas City Chiefs defensive lineman Allen Bailey strips the ball from Oakland Raiders running back Doug Martin and recovers the fumble for the Chiefs. 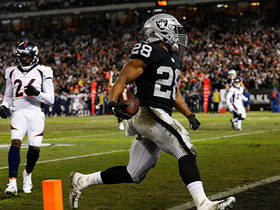 Watch all the best runs from Oakland Raiders running back Doug Martin in his team's win against the Denver Broncos in Week 16. Oakland Raiders running back Doug Martin runs for 12 yards and a first down. Oakland Raiders running back Doug Martin gets some help from his blockers up front for a big 14-yard run against the Denver Broncos. Oakland Raiders running back Doug Martin runs 11 yards for a first down. Oakland Raiders running back Doug Martin rushes for a 24-yard touchdown. 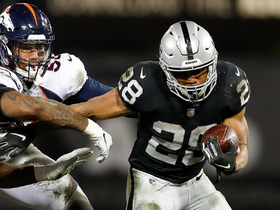 NFL Network's Maurice Jones-Drew joins NFL Senior Fantasy Analyst to predict how the running backs will perform in the Monday night matchup between the Denver Broncos and Oakland Raiders. 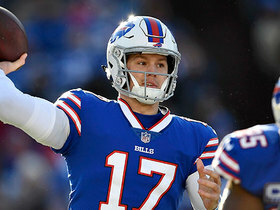 NFL Network's Matt "Money" Smith gives his daily fantasy values for various players in Week 16. 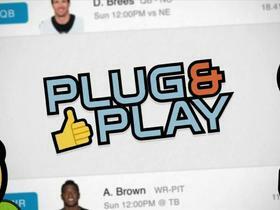 The "NFL Fantasy Live" crew decide a viewer's lineup for Week 15. The "NFL Fantasy Live" crew breaks down players sitting on your bench that could make it into your starting lineup for Week 15.